A UCF student swam with the sharks and came out with a $50,000 investment in his business. 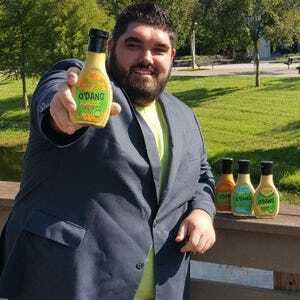 Jesse Wolfe, CEO of O’Dang Hummus and business management senior, appeared on ABC's Shark Tank Friday night and landed a deal with "sharks" Lori Greiner and Robert Herjavec. They will give Wolfe $50,000 in exchange for 20-percent equity in O'Dang Hummus. Wolfe came in to the "shark tank" initially asking for $50,000 in exchange for 10-percent equity in his company. He also received offers from sharks Kevin O'Leary — also known as "Mr. Wonderful" — and Mark Cuban, but ultimately turned them down to partner with Greiner and Herjavec. Recently, he landed a deal with Publix Super Markets, and O'Dang Hummus will soon be on shelves in 1,100 Publix stores. In addition to his hummus, Wolfe introduced to the sharks a new product he has been developing — an oil-free hummus salad dressing that comes in three flavors. Wolfe, who has been in college for nine years, invested $40,000 himself toward his business to help push it to success, and his emotions shone through when Shark Tank producers asked about his deal. “It means the world ... I quit my job, cashed in my retirement and stuff to get to this point ... There’s no better feeling,” Wolfe said in a Shark Tank interview.